Increasingly, there is evidence that systematic measurement and continuous improvement of health care quality and accountability for results have the potential to yield significantly better clinical outcomes to the patient, as well as higher levels of effectiveness and greater efficiency of medical care. Improving the quality and optimising performance is a continuous process that engages all staff across an organisation or system. Recognising this, m4h works closely with partners to make continuous quality improvement (CQI) an integral aspect of health care at all levels of a project. 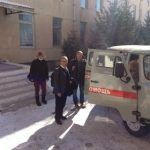 In line with its own principles of Quality Management, m4h has participated in a series of assignments to support ‘Quality of Health Care’ in Cameroun, Uzbekistan, Kazakhstan, and Tunisia. Our expert team works with hospital managers, representatives of health ministries and health care providers, para-public and academic institutions, civil society organisations and professional associations across different sectors of the health care system in setting up interventions to improve performance and outcomes by building on strengths and successes. 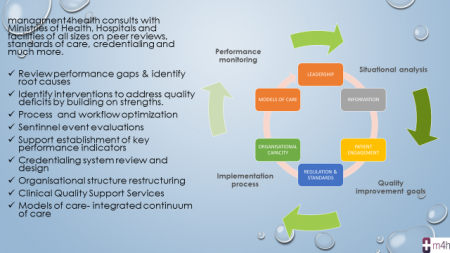 In cooperation with partner institutions, m4h completes a detailed analysis and diagnostics of processes and develops / recommends organisational and structural reforms and workflow improvements. We analyse the situation and develop concepts tailored to specific needs that support the health care provider organisation in the implementation of data-driven quality improvement (QI) measures and systems. Incorporating years of experience and following the principles of evidence based medicine (EBM) we evolve the QM processes into optimal interdisciplinary clinical pathways based on guidelines, standards, and state of the art ‘best practice’. In Uzbekistan, m4h works collaboratively with the Ministry of Health and GIZ to prepare the ground towards a national accreditation programme. m4h provides capacity building to decision makers at MoH and hospital managers on the topic of ‚Quality Management in Health Care‘ in the context of the GIZ funded project ‚Use of modern, advanced medical technologies‘ project. The programme is designed to improve clinical outcomes, efficacy, effectiveness and efficiency in health care delivery and to reinforce patient safety through systematic quality improvement measures and systems in hospitals. The support provided by m4h includes a review of current QM policies, processes, procedures, and tools. This is followed by the development and practical implementation of a quality improvement plan which encompasses systematic monitoring and evaluation (M&E) of key performance and quality indicators, introduction of patient safety and critical incident reporting systems, investigation of medical errors / Root Cause Analysis, support to the development of clinical guidelines and pathways following the principles of Evidence Based Medicine, establishment of risk management systems, and ultimately the accreditation of services (departments), and facilities. In Cameroun, where fragmentation of services and poor quality of care are considered key obstacles to the successful implementation of health programmes, m4h works under the auspice of the GIZ Health Systems Strengthening Programme, to support ‘Continuous Quality Improvement’ with a particular focus on Sexual and Reproductive Health. MOH and Development Partners have spent efforts and resources to develop and introduce various quality approaches at the operational level with mixed results. There is limited consensus between the Ministry of Public Health and Development Partners on a harmonised and standardised procedure for quality care. m4h’s scope of work includes a review of the various QM initiatives, models and existing systems (in the area of Reproductive Health / Family Planning) and the development of a proposal for a system of comprehensive and continuous quality improvement of health services. The success of a QM intervention will depend on maintaining a clear focus on implementation, sustaining interest and commitment. Leadership support is fundamental to give quality of care a “champion” and facilitate its institutionalisation at the health system, ensuring high-level management support. All actions are continually monitored, to determine how the process is moving forward and to modify the process as needed. Documenting progress, challenges and achievements are crucial to the implementation process. The team supported the identification and selection of performance monitoring indicators to create a standardised Quality Management monitoring mechanism of RH / FP services.